If you’ve ever taken a plane ride somewhere in the United States hovering closely over select cities, there’s a small chance that you may have caught a glimpse of the works of Project Blackboard, an initiative to bring life to the archetypal black basketball courts where streetball finds its roots. What you’re witness to are vibrant works of art that double as a playing ground for the sport and most recently, Nipsey Hussle’s memory was preserved with a special mural becoming the latest work to come of Project Blackboard, in partnership with the Venice Basketball League. Across 78 feet of pavement, artist Gustavo Zermeno created a basketball court bearing Nipsey’s likeness, overpowered by a blue backdrop and the words, “The highest human act is to inspire” written above a profile image of Hussle, who was gunned down just blocks away from the basketball court two weeks ago. The court was officially unveiled outside of the Crete Academy charter school on Sunday (April 14th) and was immediately christened with a high school showcase and All-Star game. 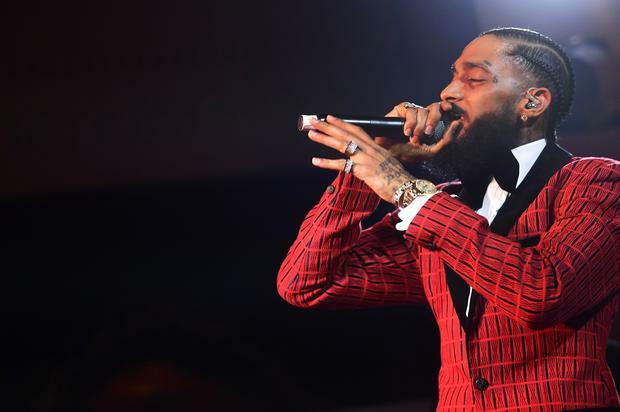 It’s the latest effort to pay tribute to Nip, whose memorial service was held in Los Angeles at the Staples Center, drawing thousands wanting to pay their final respects to the rapper, businessman, and philanthropist.